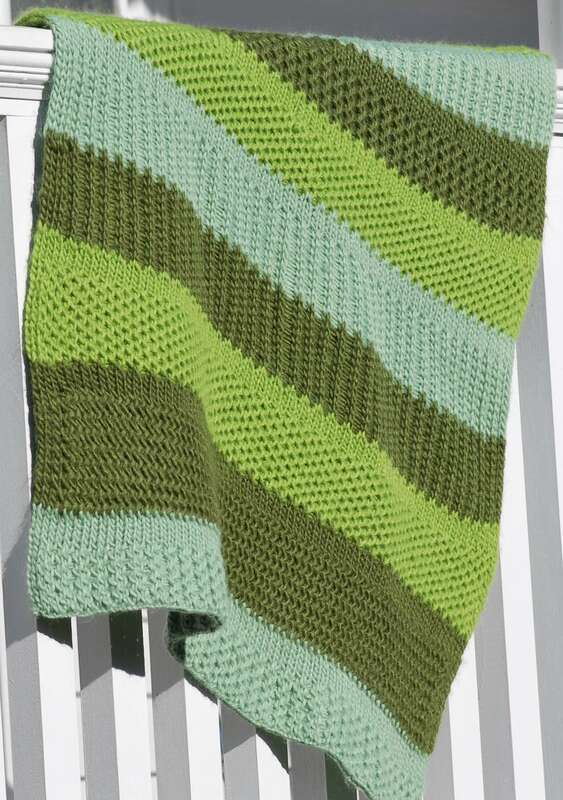 As the earth begins its beautiful change of colors, we can enjoy the green shades with this cozy afghan. 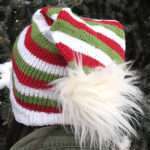 Fun to knit in 3 shades of green and lots of stitch patterns. Add fringe for a unique cozy look or, knit up some sofa pillows in each color. Yarn: Lion Brand New Basic, worsted weight, 75% wool & 25% acrylic. Machine wash, gentle; lay flat to dry. Colors used in sample are Lt Green 173 Thyme (T), Dark Green 174 Olive (O), Bright Green 172 Grass (G), (3) skeins of each. Gauge: Stockinette stitch is 3 sts X 4 rows = 1 inch. *Soft Braid Stitch: Weave 2 row patterns. This is similar to the Open Braid. Row 1 starts on back rail on peg one down to peg four on front rail. Weave at this angle around every other peg to end of rail. Return the weave by covering all empty pegs. Hook over. Row 2 starts on back rail on peg one and down to peg 3 on front rail. Weave at this angle around every other peg to end of rail. Return the weave by covering all empty pegs. Hook over. Repeat these 2 rows for the Soft Braid stitch. Cast on 82 stitches in Stockinette with T yarn. Work 10 rows in Soft Braid stitch. Work 5 rows in Stockinette stitch. Cut yarn with 3” tail. Tie on O yarn at 2nd peg to tail of T yarn. Lay both yarn tails between pegs. Work 18 rows in Zigzag stitch. Work 6 rows in stockinette stitch. Cut yarn with 3” tail. Tie on G yarn at 2nd peg to tail of O yarn. Lay both yarn tails between pegs. Work 16 rows in CrissCross stitch. Tie on O yarn at 2nd peg to tail of G yarn. Lay both yarn tails between pegs. Work Open Braid stitch for 14 rows. Cut yarn with 3” tail. Tie on T yarn at 2nd peg to tail of O yarn. Lay both yarn tails between pegs. Continue with Open Braid stitch for 14 rows. Tie on G yarn at 2nd peg to tail of T yarn. Lay both yarn tails between pegs. Work 14 rows in CrissCross stitch. Tie on O yarn at 2nd peg. Lay both yarn tails between pegs. Work 12 rows in Open Braid stitch. Work 10 rows in Open Braid stitch. Work 6 rows in stockinette stitch. Cut yarn. Work 12 rows in CrissCross stitch. Work 6 rows in stockinette. Cut yarn. Work 14 rows in Soft Braid stitch. Cut the yarn with 3” tail. Ready to bind off of loom. Bind off of loom with basic bind off using crochet hook. Start at end opposite the yarn tail. Pick up first stitch, both loops, from both rails. Pull one thru the other. One loop remains on the crochet hook. Pick up one loop from next stitch, front rail and work the stitch. Next, pick up back loom from same stitch, and work the stitch. Continue across the loom working each loop alternating from back rail to front rail until only one loop remains on crochet hook. Pick up the yarn tail and pull it thru the last loop to knot. Then gently pull the yarn tail into the knit. Your blanket is off the loom. Bind off at anchor yarn in same way starting at end opposite the yarn tail. 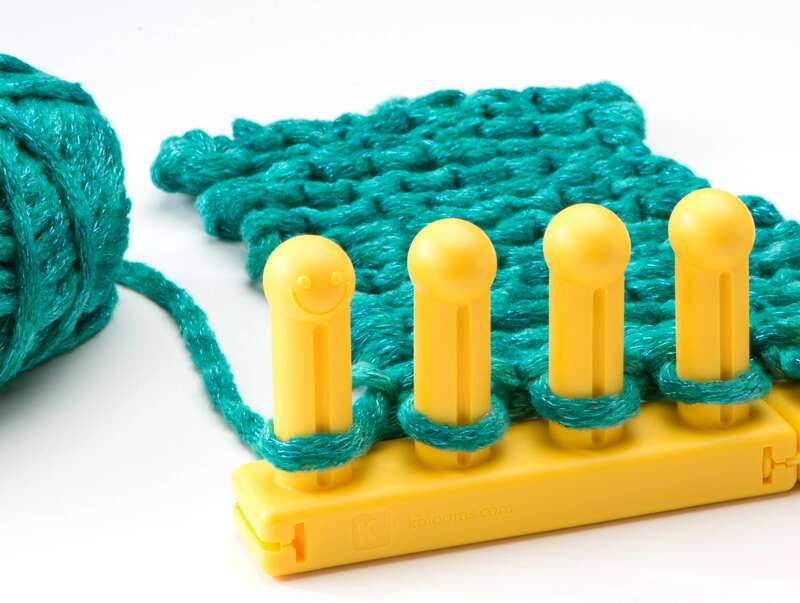 Pick up 2 loops with crochet hook and work. Pick up next single loop and work. Continue across the knit until last loop remains on crochet hook. Pull yarn tail thru loop for knot, and weave into knitting. Check blanket to see if any yarn tails extend out, and weave them into knitting. Lightly block blanket by laying on flat surface like a mattress and insert straight pins to secure. Lightly mist and allow to dry. Remove all pins. 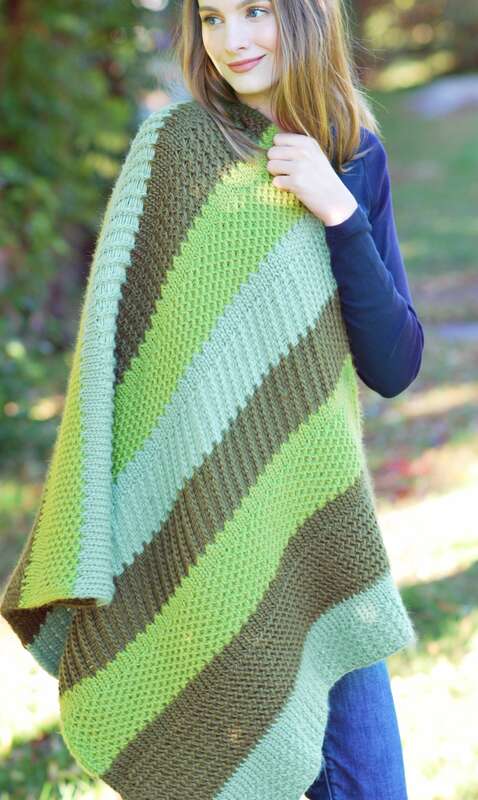 Your new afghan is ready to grace your home or give as a Christmas gift. Hello HELP, I have been working on a blanket for awhile now and have noticed the middle of my wooden knitting loom is appears to be warped in the middle. Is this normal is it due to tension and should I start over?? Question: I’ve made about 60 scarves since this past spring using various yarns. My stiches seem uniform, not tight, but after finishing the scarves, maybe within hours though usually days, the scarves shrink in length often to half the length. What do I need to do differently or is this normal? 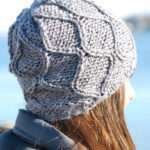 What is most important is how does your knitting look? Is it tighter in the center from the end edges? If all looks well, I would keep going and complete and try to weave a bit looser in the center area. This is not how the loom should look, and one of your rails could be slightly warped and bow inward. Please email me at pat@knittingboard.com after you have completed the blanket. We may be able to remedy the problem. Please leave email at pat@knittingboard.com and I can send the file to you. Hi Karen, You may want to try a thicker yarn or a tighter stitch that doesn’t stretch out so much. It sounds like your stitches are just open and bouncy. You can always knit the scarf longer than desired in the end as it may look longer while on the loom. The Soft Braid Stitch seems identical to the CrissCross stitch, unless I am missing their difference in their instructions.